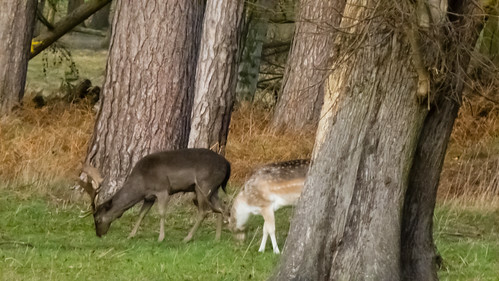 Some bucks from the herd of fallow deer at Wollaton Park, Nottingham, taking their ease on the golf course where they probably get less human (and canine) disturbance than in the public section of the park from which these pictures were taken. This was an all-male group – the females don’t have antlers. There were two forms of coat, dappled and “black”. From the distance where I was standing, it looked like two different species of deer.